We are proud to have pioneered the sheared Plantation Oregon Douglas Fir Christmas tree — our best selling and most popular Christmas Tree. This fragrant tree is economical and a season favorite. The Douglas Fir Christmas tree (pseudotsuga menziesii) has been the most popular Christmas tree species since the 1920s. During the following 40 years, nearly all Christmas trees were harvested from forest lands. Since the 1950s, the transformation from growing trees in the wild to culturing them on plantations has been dramatic. Today, few trees come from forest lands. 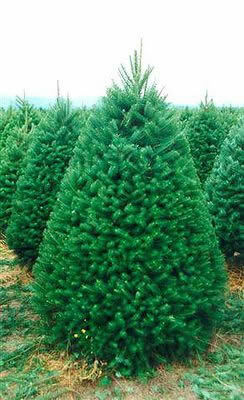 Holiday Tree Farms is a pioneer in establishing this species as the premier product of the Christmas tree industry. Nationally, it remains one of the most popular Christmas trees species. The Douglas fir Christmas tree is shipped to the majority of the United States and is also exported to the Hawaiian Islands, Mexico, Central America, Guam and Asia. The Douglas Fir Christmas tree is the most popular, having long soft blue-green needles and a sweet fragrance.